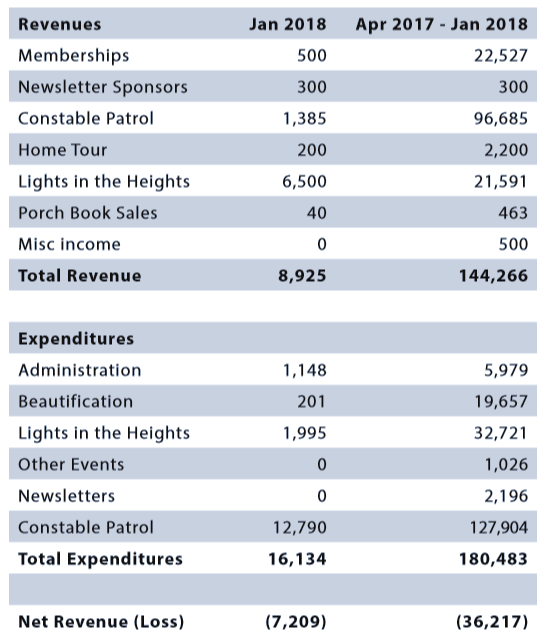 In the past, WH residents were able to pay for their WHCA dues or Constable Patrol membership online, in a fashion that automatically renewed each year. This was convenient, since once you signed up initially, you didn’t have to think about it. Everything was processed automatically each year, at least until something went amiss with their Paypal account. As convenient as that was, it also created some confusion. People would sometimes forget that they had previously setup the automatic renewal. They would make a payment manually via the web site, only to find that they had paid twice. This required that the treasurer take action to reverse the charge. This happened more often that we would have hoped. Often enough that it was burdensome to the treasurer. So, when it came time to rework how payments were handled via the web site, the option for automatic recurring payment was eliminated. Those who had such payments setup received messages both from Paypal and directly from the treasurer. As we go into our 2019-20 year, everyone must renew their WHCA membership and subscribe anew to the Constable Patrol Program. Questions about WHCA finances can be directed to treasurer@woodland-heights.org. This statement also appeared in the November 2018 printed newsletter. Questions about WHCA finances may be directed to treasurer@woodland-heights.org. Questions concerning the WHCA finances can be directed to treasurer@woodland-heights.org. Questions about the organizations finances can be directed to treasurer@woodland-heights.org. 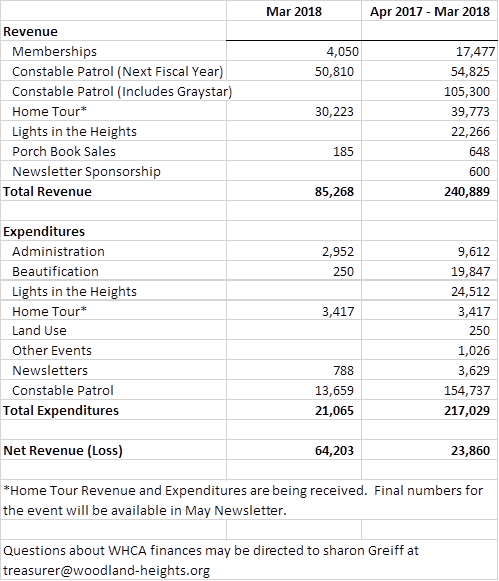 * Some of the money related to the Home Tour (April 2016) was properly recorded in the financial statements for the prior Fiscal Year (April 2015 – March 2016) when it was either received or paid. 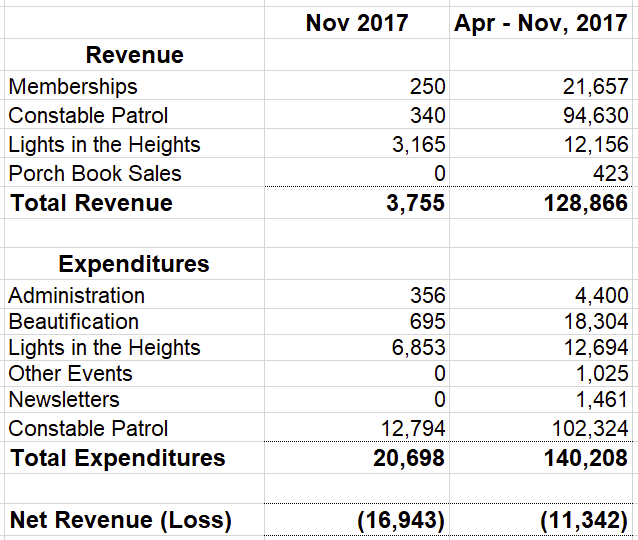 Therefore, Home Tour Revenues and Expenses shown above for the current Fiscal Year (April 2016 – March 2017) do not include the full amounts earned by the event. In total, Home Tour Revenues were $37,802 and Expenses were $5,288, creating a net inflow of $32,514 for the WHCA. 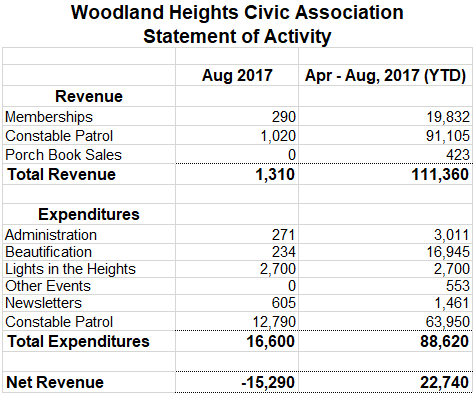 Newsletter subscribers: To view a larger version of this chart please select the article title to view the image on the Woodland Heights Civic Association website.